Ciao lovelies! 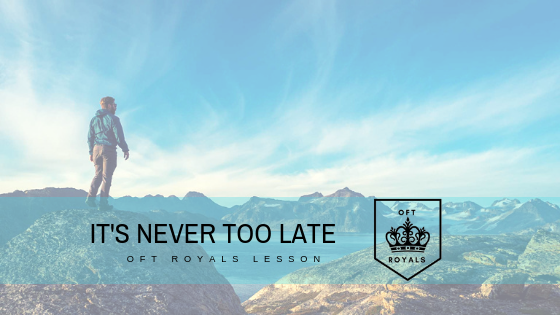 Today’s post is for those of you who feel that things are too late for you. Too late to turn around a bad situation, too late to fix something, too late. Because today I’m letting you know it’s not too late. You might feel like I don’t know what I’m talking about. “My situation is different” you think “my situation is un-fixable! It’s too far gone, it’s too late to turn it around, too much has happened, I can’t reset, I can’t fix it, I can’t make it right.” But I’m telling you, none of that is true. It is NEVER too late to turn things around for the better. It’s never too late to push forward, to succeed, to make it happen. Sometimes you just need a new lens. Take for example the case of Scott Cawthon, the man behind the wildly popular Five Nights at Freddy’s game series. He made several games before FNAF, and was criticized for the creepy nature of his characters, people said they looked like creepy animatronics. So Cawthon took this criticism, and used it to his advantage. He created the wildly popular FNAF game, a game centered around “Creepy” animatronics and a haunted pizzeria. And it took off. Another great example of someone wildly successful who at first failed is Walt Disney. Disney was fired from his job at the Kansas City Star because they said he “lacked imagination.” He had several more failures before finally reaching success. Need another example? How about JK Rowling. Rowling was living in near poverty when she came up with the idea for Harry Potter. Publisher after publisher denied Rowling, until finally one said yes. My point is that you will go through failures before you hit success. But if you keep trying, pushing forward and persevering you will eventually succeed. You need to give it your all, and don’t let anything stand in your way. Because truthfully, it’s never too late to turn things around. It’s really entirely up to you. You can’t let setbacks end your story. You must believe in your dreams, do everything you can to see them through. I believe in you. I know that no matter what you do, you can turn it around if things don’t go your way. You can succeed and conquer whatever stands before you.